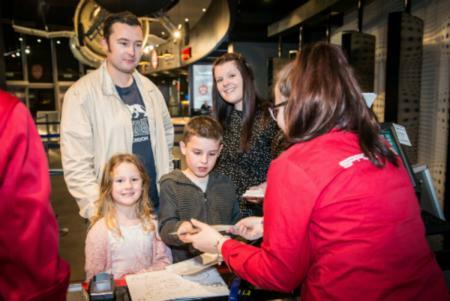 The National Space Centre is a day out that the whole family will enjoy; it’s a fun, interactive and accessible way to learn about the universe we live in. 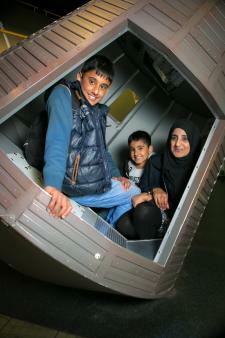 Just don’t be surprised if you leave with a budding astronaut or two! Travel the length and breadth of the universe at the National Space Centre in Leicester and wonder at the immensity of space. Dani Zur visited with Eva, 11, and her friend Adam, 11. 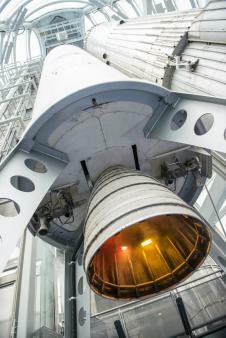 That sense of wonder about space never leaves us, which makes a visit to the National Space Centre a sure hit with children and adults alike. 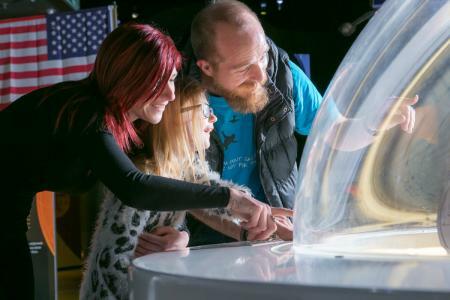 Step inside this impressive East Midlands building, and you can watch the birth of the universe, see stars be born and die, take part in the space race and train as an astronaut for a mission to one of Jupiter’s moons… and that’s all before lunch! A lot of the activities are not suited to very young children – and there are height restrictions on some of them – however there are special events that even the youngest family member would love, like a chance to meet the Clangers. Check out what’s on before you plan your visit. 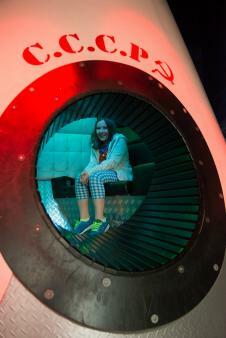 The exhibition on exploring the universe is sure to capture young minds. We loved finding out how the Solar System was made, how long it takes for the light from a star to travel to Earth, and how big the universe is (a trip in the image enhancer to the outer edge of the known universe made us realize just how tiny we are). We even watched a video about how our own sun, Sol, is going to die! And if you’ve ever fancied presenting the weather on TV, now’s your chance. You can film your own weather forecast for a day in the year 2085 (and then email yourself the video). The effects of global warming mean it’s going to be a scorcher! KS1 kids will also love the chance to experience what it’s really like to be an astronaut, from dealing with weightlessness to space sickness and even going to the loo! 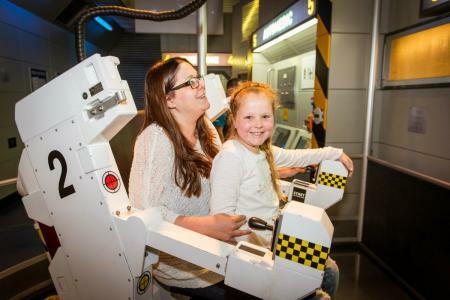 You can have a go at building a rocket, get your hands on the controls of a Mars rover and even use thrusters to go on a space walk. They also loved the interactive star maps, which allowed them to zoom in on constellations, star systems and planets and taking the agility test to see if they were fit for space. The highlight of our visit was the Planetarium. We watched We Are Stars, which told the story of us: what we are made of; where we came from; and our journey from the birth of the universe to life on Earth. Sitting back in the comfortable seats we were completely immersed in the 360-degree cinema experience. It was one of the best shows of its kind we’d ever seen and worth the price of the ticket alone. We also loved the SIM 3D flight to Europa, which is a high-quality journey blasting off from Earth’s moon, through radiation clouds and dodging asteroids, to arrive at Jupiter’s inhospitable ice moon. Check out what’s on before you visit as there is an exciting calendar of special activities and events. During our visit there was a chance to learn about all the gross stuff our bodies do in space, and there are events coming up to celebrate the return of Tim Peake. We stopped for drinks and snacks in Boosters Café, which has hot and cold drinks, sandwiches and light snacks, as well as some healthy children’s options. The Space Centre is easy to find (it’s just a couple of miles off the M1 in Leicester) and there is a large car park that costs £3 for the day. Tickets are £14 for adults, £11 for children aged 5-16 and under 5s go free. Opening times are Monday to Friday 10-4, Saturday and Sunday 10-5. There is lots to buy in the shop, including pencils, stationery, posters, science toys and books. We spent our pocket money on a projector torch (£4.99), alien egg (£1.99) and rocket launcher (£7.99). Explore the Space Centre's extensive astronauts area on the website to find out more about the men and women who've ventured into space.